A historic $1 million gift to Hendricks Chapel will assist students experiencing financial hardship and ensure access to academic enrichment opportunities that would otherwise be unavailable to them, announced Hendricks Chapel Dean Brian Konkol. The gift, from a Syracuse University alumnus and his wife who wish to remain anonymous, will launch the Hendricks Chapel Student Opportunity Fund. Konkol says the gift appears to be the largest single gift ever made to Hendricks Chapel. The new endowment fund, which will be administered by the dean of Hendricks Chapel, will complement the University’s established network of financial aid and social support. The fund is designed to help cover the financial gap for students having difficulty covering their basic needs or unanticipated costs, freeing them to better focus on their coursework and maintain their academic progress. Categories of support may include food, clothing, emergency travel, emergency healthcare expenses, and other nonacademic expenses. 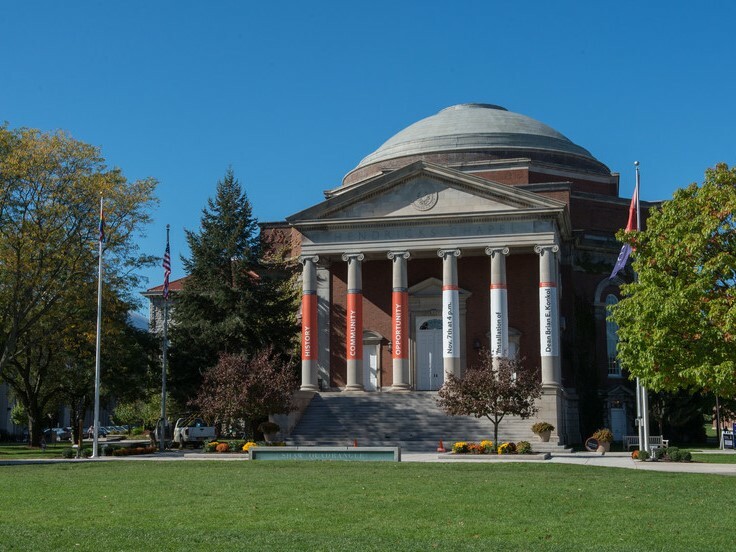 Since its dedication in 1930, Hendricks Chapel has defined and embraced its role as the physical and metaphorical “heart” of Syracuse University. In addition to serving as a spiritual home for a diversity of communities and programming, a key aspect of its service includes a pantry stocked with food and personal care items, in addition to a system of financial loans and grants, all of which draw visits from an assortment of students each academic year. According to a recent study by Temple University and the Wisconsin HOPE Lab, researchers found that 36 percent of students at 66 surveyed colleges and universities do not receive enough to eat, and a similar number lack a secure place to live. By building upon the existing programs designed to support those in need, the new student opportunity fund will expand efforts to support and prepare students as engaged citizens, scholars and learners in a changing global society. In addition to meeting basic needs, the new fund will help to defray costs of out-of-classroom opportunities—such as study abroad and unpaid summer internships—to students for whom such programs and enrichment experiences might otherwise be out of reach. Others can donate to the endowment in order to build and sustain the fund for future generations of students. For more information on how to make a gift to the Hendricks Chapel Student Opportunity Fund, contact David Wishart at awishart@syr.edu or 315.443.2766. For information on how to apply for aid from the fund, contact Rebecca Reed Kantrowitz at rrkantro@syr.edu or 315.443.5127.